This salt is founded deep within the Himalayan mountain range, with the high mineral content of Himalayan salt it can be used as a healthy alternative to table salt or can be used as an additive in cooking. As a natural sea salt, Himalayan rock salt is high in sodium, which is essential for your body to function properly; in addition to regulating blood levels and pressure. Long with sodium, Himalayan salt has high quantities of phosphorous, calcium, potassium, iron, magnesium, zinc, selenium, copper, bromine, zirconium and iodine. Omninaturals Himalayan salt is Food Grade Standard of which means that it is ideal to use as a table salt but can also be used for luxurious premium bathing purposes. Naturally cleansing and rich in essential skin minerals, Himalayan salt is the perfect detoxifying additive for bathing purposes. Restoring lost minerals and vitamins throughout the day, this is perfect for relaxing aching muscles and will leave the skin feeling cleansed and invigorated with super soft skin. 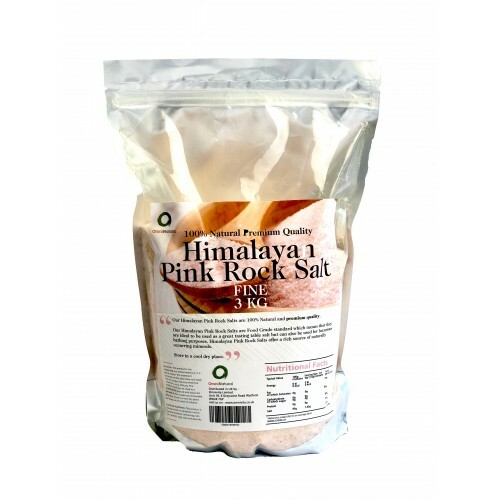 Pure Fine Quality Himalayan Pink Salt 100% Natural 1-2mm Himalayan pink salt has a source of minerals and trace elements which our bodies need. Himalayan salt contains over 84 minerals, including Magnesium, Potassium and Calcium, which are essential to human life. Himalayan pink salt is suitable for use in baths as well as for culinary purposes. In cooking: Use this delicious salt as an additive to food, or use in cooking. Bathing: Add 1-2 cups in bathtub at 37-39c, then soak for 20 minutes.